Do you get frustrated by long drill-downs before you find the setting you are looking for? If this happens to you, then why not learn how to type a handful of PowerShell commands to obtain all the information you are seeking quickly and easily. Here are a collection of interesting scripts for you to learn how to use the PowerShell command-line in Windows 8. To get started just type ‘PowerShell’ in the Windows 8 Search box. I always select the ISE (Integrated Scripting Engine) version so that I can store, amend, and experiment with my scripts easily. ~tmp files have a habit of hanging around even in Window 8. It’s always worth having a clear-out of these old temporary files. Let us experiment with PowerShell cmdlets before we actually remove any temporary files. Note 1a: $Env is a built-in Environmental variable. -recurse tells Get-ChildItem to trawl through the sub-directories under temp. Note 1b: $FileList is a variable I created for this PowerShell example. Trace how the output of Get-ChildItem becomes the input of Where-Object, and how this transfer is controlled by PowerShell’s (|) pipelining. Note 1c: This Windows 8 PowerShell script also contains a loop. Foreach is but one of the looping technique for automating scripts. We now ready to introduce the Remove-Item cmdlet, keep in mind there is no ‘Delete’ verb, instead PowerShell consistently uses ‘Remove’. Note 2a: Don’t worry if you get ‘Access denied’ error messages. However, do rerun Example 1 and confirm that this PowerShell script has vastly reduced the number of Windows 8 temp files. One reason for learning how to write PowerShell scripts rather than use the GUI is that you can access areas where there is no Windows 8 GUI, or the information is spread inconveniently over 2 or 3 menus. Looking at Windows Management Instrumentation (WMI) is rather like using a probe to see what’s happening deep within the Windows 8 operating system. Note 3a: GM is an alias for the Get-Member cmdlet. Guy Recommends: WMI Monitor and It’s Free! Windows Management Instrumentation (WMI) is one of the hidden treasures of Microsoft’s operating systems. Fortunately, SolarWinds have created a Free WMI Monitor so that you can discover these gems of performance information, and thus improve your scripts. Take the guess work out of which WMI counters to use when scripting the operating system, Active Directory or Exchange Server. Give this WMI monitor a try – it’s free. From the properties of Win32_ComputerSystem we can check whether your computer specification is as you expected. Note 4a: PowerShell’s backtick (`) instructs the first line to wrap over onto the second line. The converse, without the backtick PowerShell would assume two separate commands and the script would fail. See more on Windows 7 and PowerShell cmdlets. Here is just a bit of fun; PowerShell tackles a real-life task of measuring a website’s response time. Write-host "Average response time to $Server is $Calc ms"
Note 6a: Test-Connection is a built-in PowerShell command which mimics ‘Ping’. Note 6b: Observe how the results are piped (|) into Measure-Object. Note : Naturally you need to be logged on with an account which has the appropriate Exchange Server roles. 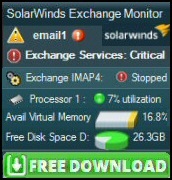 Here is a free tool to monitor your Exchange Server. Download and install the utility, then inspect your mail queues, monitor the Exchange server’s memory, confirm there is enough disk space and check the CPU utilization. This is the real deal – there is no catch. SolarWinds provides this fully-functioning freebie, as part of their commitment to supporting the network management community. By default each PowerShell cmdlet returns only basic information; consequently, the most useful parameters are often hidden. One way of extending your repertoire of switches is by prefixing the name of the Verb-Noun you are currently using with Get-Help. Let us use Get-Date as an test vehicle. On its own Get-Date does what you may expect, it returns the current date and time. But suppose you wish to script the time-zone offset? Get-Date -uFormat "%A Time zone %Z"
Note 1a: There are two points to remember with Get-Help, firstly, there is no need for the | pipeline, and secondly, I always append -full because I like examples of the cmdlet in use. Run without modifiers, Get-Command lists all PowerShell’s 400+ cmdlets. When I research a task I often have an idea of the command that I am looking for, so I employ the asterisk (*) judiciously. Imagine the scenario, you want to create a Windows 8 PowerShell script instead of using the Task Manager, the problem is that you see the Process tab in the Task Manger GUI you don’t know the name of the corresponding PowerShell cmdlet. Get-Command # This gives too much information! Note 2: You can even apply Get-Help to Get-Command, this how I discovered the -noun and parameter. Most PowerShell objects has more properties and methods than you can ever imagine. To access this ‘hidden’ store of scripting tools never miss a chance to pipe a cmdlet, or object into: | Get-Member. I will be surprised if you don’t find at least one property or method that will improve your original Windows 8 script. Note 3a: Even Get-Member has parameters. If you investigate with Get-Help you will find a useful switch, or to use its correct name, parameter called -MemberType. This is how it filters properties and omits methods from the result. Note 3b: You really do need the pipe (|). Here is an example script of how this technique may bear fruit. Let us imagine that we are interested in these properties: Handles, PriorityClass, or StartTime, then this is how you modify the output of Get-Process. Note 3c: This example employs Format-Table to display the results, and more importantly, to select the best properties to list in the output’s columns. Challenge: Research with -MemberType, then amend my example so that it displays different properties. PowerShell mimics what you can do in a Windows 8 GUI. The benefit is that with a script you can issue commands quicker, and with greater precision, that by clicking through the corresponding Windows menus. Remember that he basic PowerShell unit is a verb-noun cmdlet. PowerShell’s signature tune is | which is known as the pipeline. The concept is that the output of the first command becomes the input of the second, or third pipeline. Employ Get-Member to research methods and properties, which you can use to refine your Windows 8 script. Diagnose and troubleshoot your slow internet issues and high bandwidth usage issues. Free Whitepaper. Tired of putting out Exchange fires every day? Read this ebook to learn some tips and best practices to help you be proactive. Become the master of your Exchange environment and troubleshoot performance issues faster than ever! Get a better handle on network monitoring tools, streamlining your network monitoring process and put you in control to manage your growing network. Computer Performance Copyright © 2019.